Had two bubble mailers on the desktop today when I came home for good after a short stint in another city for work. And the cards in them was great! The first one was from ebay. 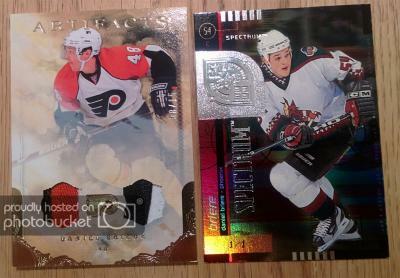 A nice 2010-11 Artifacts Patches Gold #41 Daniel Briere /15 with 3clr + 2clr patches. The second one was not from ebay, even if it was listed there. I´ve been talking to Nick about it before, but the price was too high. After more than a year without speaking about it we started negotiating about the card again. And we came to an agreement. And now I´m a happy camper. Not often you see a 1/1 from the 90´s. 1998-99 SPx Top Prospects Spectrum #48. Awesome 1/1. Those tough parallels from the 90's look excellent, and this one if a great example of that. Congrats on the fantastic additions to your Briere collection!